InfoSec Handlers Diary Blog - What is happening on 2323/TCP? SANS ISC: InfoSec Handlers Diary Blog - What is happening on 2323/TCP? What is happening on 2323/TCP? 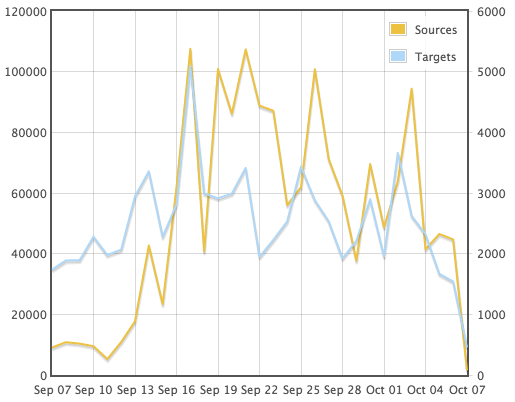 A number of sources, including DShield, have noticed an uptick on port 2323 TCP beginning around 3 weeks ago. This is the scanner portion of the Mirai botnet scanning for IoT devices on both 23/TCP and 2323/TCP. There are a number of IoT devices that use port 2323/TCP as an alternate port for Telnet. Those who have setup listeners on port 2323 are seeing brute force credential attacks utilizing a small dictionary.